Size 9mm (One Pair) / 5mm (One Pair). Shape Perfect Round. Classic stud earrings made of solid 14K yellow gold with TWO- lovely organic natural golden, genuine South Sea cultured pearls from Australia. Pearl Society carry a wide selections of Japanese Akoya, South Sea White, South Sea Golden, Tahitian Pearls and the Premium Fresh Water Cultured Pearls; specially designed to fit every style and budget. Size 9.2mm (One Pair) / 5.2mm (One Pair). Shape Perfect Round. Surface Overall Very Smooth AAA . Pearl Society carry a wide selections of Japanese Akoya, South Sea White, South Sea Golden, Tahitian Pearls and the Premium Fresh Water Cultured Pearls; specially designed to fit every style and budget. Shape Perfect Round. Surface Overall Very Smooth AAA . 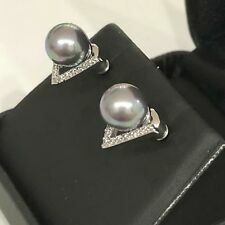 Type Mabe cultured pearl Luster High. Size 14-14.2mm Country of Origin South Sea. Color White Surface Smooth. Luster High Luster AAA . Nacre Thicker Nacre AAA . Surface Overall Very Smooth AAA . Shape Perfect Round. Genuine Pearls! Not Shell Pearls! Pearls Shape. Pearls Size. Pearls Luster. Pearls Nacre Thick. Pearls Surface. 18K Solid Gold (Marked). •These sweet earrings feature lustrous, hand-carved, black lip oyster, mother of pearl cats (7.5x6mm) with beautiful blue-green and red-purple iridescence. They have been matched for size, shape, and luster. AAA 5mm White Akoya Pearls &18K Solid Yellow Gold Agate Earring Necklace Set. Shape Perfect Bread. Surface Overall Very Smooth AAA . •These sweet earrings feature lustrous carved mother of pearl flowers (10mm) with top-quality, rosy-white genuine 2mm perfectly round cultured pearls it's the center. The pearls have gorgeous luster and clear complexion and the flowers have been matched for size, shape, and luster. Natural big baroque pearls. pearl size: 16X13 mm. Shape Perfect Bread. Surface Overall Very Smooth AAA . Luster High Luster AAA . Nacre Thicker Nacre AAA . Shape Perfect Round. Size 7.3mm. Shape Perfect Round. Luster High Luster AAA . •These classic earrings feature two top-quality, rosy-cream white genuine 8-8.5mm perfectly round (not button) cultured pearls with gorgeous luster and clear complexion. The earrings are studs and closures are push backs. Shape Perfect Round. Get images that. Shape Perfect Round. Surface Overall Very Smooth AAA . Size 2x5mm & 2x9mm. EDISON PEARLS are result of one of the latest fresh water pearl culturing techniques. Pearl Society carry a wide selections of Japanese Akoya, South Sea White, South Sea Golden, Tahitian Pearls and the Premium Fresh Water Cultured Pearls; specially designed to fit every style and budget. 100% Real Pearl. pearl size: 8-8.5mm. Q: Can l get my necklace or bracelet in a longer or shorter length?. color :white. A: Yes, we're an original supplier. A: I am sorry. I can't do this. The regulations do not admit of our doing that. These classic earrings feature two top-quality, cream-white genuine 6.5mm perfectly round (not buttons) cultured pearls with gorgeous luster and clear complexion. The earrings are studs and closures are push backs. Luster High Luster AAA . Nacre Thicker Nacre AAA . Surface Overall Very Smooth AAA . Luster High Luster AAA . Nacre Thicker Nacre AAA . Surface Overall Very Smooth AAA . Size 8mm (One Pair). Shape Perfect Round. •These classic earrings feature two top-quality, rosy-white genuine 5-5.5mm perfectly round (not buttons) cultured pearls with gorgeous luster and clear complexion. The earrings are studs and closures are push backs.